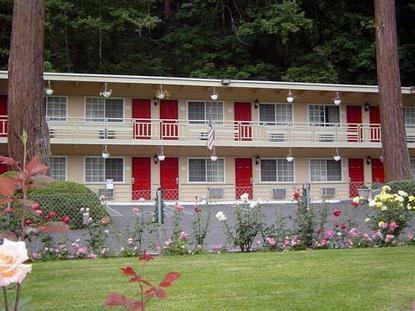 The Econo Lodge hotel is conveniently located just 14 miles from Big Basin Redwoods State Park. This Ben Lomond hotel is minutes from area attractions like the Santa Cruz Beach Boardwalk and Paramount's Great America. The Norman Y. Mineta San Jose International Airport is 25 miles away. The hotel is nestled among towering redwood trees, next door to Howden Castle and overlooking the San Lorenzo River. Guests of this Ben Lomond hotel will enjoy many amenities, including: Free continental breakfast,Free local calls, Free coffee. Pet accommodation: 25.00 per night, per pet. One pet per room, up to 25 lbs. Please note on reservation if guest is bringing pet. 100 percent smoke-free hotel.